Whether you want to write your own Web applications or move existing applications to the Web, IBM lets you do this with a number of host access products. The newest addition is the IBM WebFacing Tool – part of the new WebSphere Development Studio Client for iSeries (Development Studio Client). The WebFacing Tool converts existing Data Description Specifications (DDS) into Java artifacts that are deployed in an application server. With the WebFacing Tool, existing iSeries applications require minor or no modifications and are accessible from the Web and iSeries display devices. 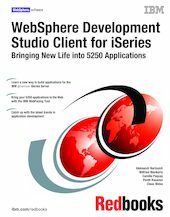 - WebSphere Studio Site Developer Advanced: The new integrated development environment (IDE) for developing applications. It offers the unique ability to add new features in the form of plug-ins. - Cooperative Development Environment (CODE): Workstation- based tool that supports the development of applications in many different host languages, including RPG and Java. - VisualAge RPG: Allows you to create and maintain client/server applications on the workstation. - IBM Distributed Debugger: Lets you detect and diagnose errors in code developed with OS/400 Integrated Language Environment (ILE) and Original Program Model (OPM) languages and Java.